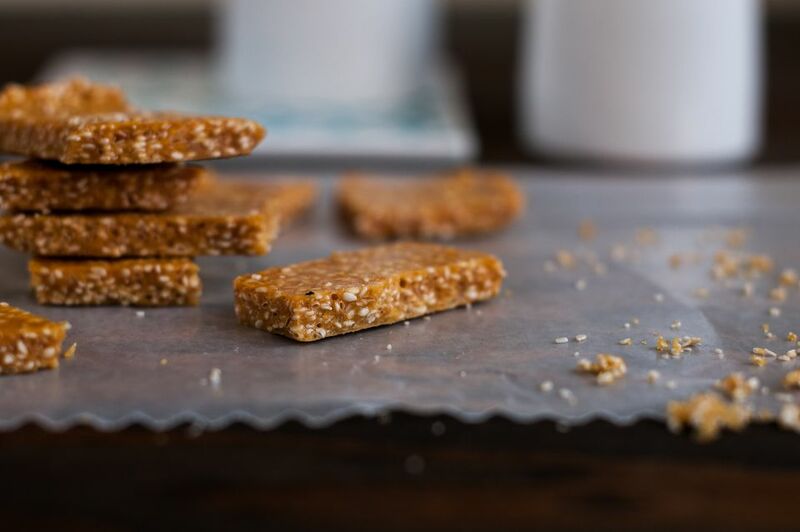 Something of an ancient Greek version of a power bar, pasteli has been made with the same two ingredients for millennia: honey and sesame seeds. The version of pasteli most commonly sold in markets is generally hard--it's the addition of refined sugar in those recipes that make it that way. This classic version does not use refined sugar, allowing the traditional honey to create a chewy texture. The quality and taste of the honey will have an effect on the final product. Try this recipe with the organic honey of your preference (thyme, wildflower, fir, pine, chestnut, etc.). You also may want to look for sesame seeds in bulk, as they can be quite expensive, especially when purchased in small quantities. This recipe calls for an optional lemon peel to give the pasteli a light hint of citrus. You can omit, but the lemon flavor adds a bit of zing to this treasured Greek treat. Pasteli can be eaten as candy at any time, or as an energy booster, and it is a wonderful accompaniment to tea. Because it is very sweet, cut it into small pieces. Those with a sweet tooth can always eat more! In a saucepan, bring honey and lemon peel (if using) to a boil. Add sesame seeds, stirring continuously. Continue to cook while stirring to mix completely and thoroughly. When the seeds are fully mixed in and the mixture has boiled again, remove from heat. Remove lemon peel and discard. Place a piece of baking parchment on a cool work surface and spread out the hot mixture thinly and evenly (about 1/4 inch deep). When the pasteli cools to room temperature, refrigerate on the parchment paper (it doesn't need to be covered). Chill for at least 2 to 3 hours. With kitchen shears, cut the pasteli together with parchment paper into small pieces, and serve. To eat, peel off the parchment paper. Store in the refrigerator.